A modern culture of mass production and mass consumption has perpetrated a trend that strays farther and farther from a sustainable, natural balance with Nature. Although this graphic may represent a current reality in many parts of the globe, this is a progression that does not have to be. Many indigenous communities embody the powerful recognition that we are one with Nature. We are two sides of the same coin and no matter what we do, nothing will ever change that. 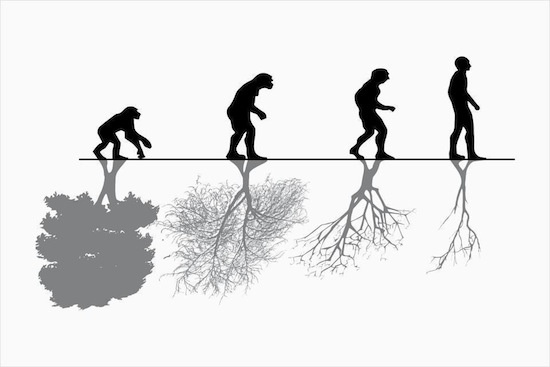 However, what this graphic so powerfully illustrates is the faltering strength and decreasing depth of humanity's connection to The Pachamama. One could say this image represents the "moment of crisis" we currently face as a collective community on this planet. As modern awareness continues to be diluted by the empty attraction of material things, the innate knowledge of our relation to Nature is buried deeper and deeper into the depths of modern consciousness. What will the future hold if this connection continues to weaken, as Nature becomes increasingly foreign and these ancient roots forgotten? Humankind is indeed presented with a crisis, as it becomes less and less grounded in a relationship to its sacred source. Answers to age-old questions of the meaning and purpose of life are often grounded in relationships to the sacred, but they are also defined by the events of one's era. What better way is there to realize that meaning and purpose are embedded all around us than to heed the call to address the vital needs of our time? The challenges we face as a civilization present us with a unique opportunity and an empowering freedom to choose. Our planetary moment of crisis is a fertile choice to engage ourselves in profound purpose and enduring meaning. Our moment in time is one full of opportunity to live one of the most meaningful lives in history. How will you choose to embrace it?